This past weekend I went to the Efes Pilsen One Love Festival. It was way better than I expected and I had a great, if not exhausting, weekend. Aside from the great music, there were various sponsors who set up interactive booths and gave you free things like t-shirts and Mentos. But the festival didn’t need Mentos to make it fresh, the music did just fine on that front. The first band we saw was M83. The music was great and there was a good vibe generally. However, Anthony Gonzalez’s stage presence was lacking. He seemed insecure and it especially showed when he would start getting into the music. The moment would be ruined when he would cast a sideways glance to the crowd to see if they were getting into it too. His disappointment or satisfaction would be written all over his face. At other times he would turn and face the crowd and somehow you could feel his expectation that we should respond. It seemed as if he was waiting for a roar of appreciation or shouts professing our love. I wish he hadn’t tried so hard to be cool. The music is good. Have fun! Morgan Kibby on the other hand was great to watch. She was into the music, her voice was absolutely enchanting and a few times she even managed to get a smile out of Gonzalez. When Tricky first came out I thought maybe he was on crack. He kept licking his face and seemed a little out of it generally. Since I didn’t know anything about him as an artist or performer I was working with a blank slate here. But as he went from song to song, it was clear that he was performing. I loved that he was trying. Not to come off as cool or as a musician but you could tell that he genuinely cared about the fans. He wanted to give a good show and he did. As with M83, the female presence on the stage was dynamite. And then, there was Starsailor. I was expecting good things from a band who drew their inspiration from Tim Buckley and had a front man that was an avid Liverpool supporter but still I wasn’t ready for what was about to happen. As the first chords were played, my knees began to go weak. I knew. A new favorite band. Someone who would be in my ipod, who would enter my home, be in the mixes I made for my friends. Each song was better than the one before. James Walsh interacted amazingly with the crowd. When he smiled you thought, he loves what he is doing. When he looked your way, you were sure the concert was just for you. At one point he mentioned that another band was coming on later. I willed him to be quiet! There was no act that could follow this. Go check them out, fall in love and then buy their album. You won’t regret it. Bulgaria. Namely Stara Zagora. When Feraz told me that was our destination, I thought it has star in the name, it can’t be that bad. 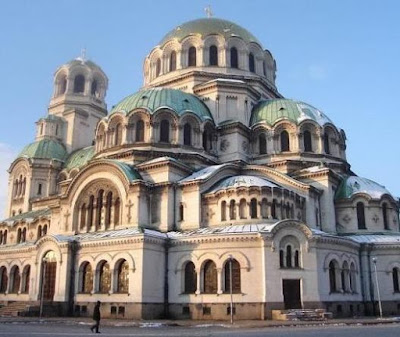 Wikipedia informed me that it was the sixth largest city in Bulgaria. Impressive! What took us to Bulgaria? Were we searching for amazing adventures? Exotic cuisines? Celebrity sightings? (Just kidding! I am over that now, remember?) Nope, we went with humble ambitions. We had to renew Feraz’s Visa. You might say, Sumeera, I am an avid reader of your blog and even read the captions in the pictures so i know that you recently went to Greece. Couldn’t you have just renewed the Visa then? Why yes, dear reader. We were indeed recently there! But as we were standing in line to get back into Turkey we looked over at the Visa line and were horrified to see there were two whole people waiting. Being the busy and important people we are, we knew there was no way we could waste precious minutes of our lives waiting to renew the Visa. The train was much better than we expected. We found an empty cabin where we each had plenty of room to lay down. Feraz said he felt like he was in Harry Potter about to go to Hogwarts. Outside the city lights of Istanbul whizzed by. Slowly the last lights faded and we passed the dark countryside. I kind of felt like Feraz and I were at camp. We had packed our backpacks full of snacks. We laid on our respective beds and passed our Tuktus and Milka Gofree bars back and forth while giggling away. Pretty soon I dozed off and didn’t stir until we hit the border of Bulgaria. After going through passport control we had another few hours on the train. When I woke up again, the sun was coming up and we were passing the Bulgarian countryside. Dotted along the coast were farm workers and run down houses and farms. It was beautiful. And then, the moment we had long waited for. Stara Zagora. When we first got out of the train station we were hit with an amazing scent. If walking in Istanbul feels like a fat man just farted in your face, walking in Bulgaria feels like you are standing next to a woman who is wearing perfume that costs $652 an oz. We walked through a park to get to the main part of town and that is when we first saw the boy in the orange shirt. He was standing sleeping up. Jealousy crept through me as I wished that I too could sleep standing up. Imagine the possibilities. Actually as I wrote this, I did try to imagine the possibilities and there really aren’t that many advantages. It seemed really cool at the time though. Breakfast called and we started looking for somewhere to eat. The best thing to do in a situation where you are in a foreign country, where you don’t know the language or where anything is, is to go where everyone else is going. We soon saw a long line on an otherwise dead street. We walked up to find that it led to what was literally a hole in the wall. I have no idea how they made this hole but there it was and inside it stood a whimsical little lady, a la Audrey Tautou. There was a huge array of pastries and desserts. (As huge as there can be in a hole in a wall) Feraz picked out a cheese pastry which cost .60 lira. He would later rank this the best thing he ate in Bulgaria. Feel free to contact me if you would like a full ranking of favorite eats in Bulgaria. But a cheese pastry alone would not do. It was time to hunt for coffee. We found something much much better. Iced coffee. Namely, Nescafe Frappe. It is so hard to find iced coffee in Istanbul and when you do it is either at Starbucks or 453534 lira. We devoured our drinks in less than 30 seconds. Then we looked around awkwardly because we had allocated a good half hour for this activity. Only 11.5 more hours to go in Bulgaria. We walked around Stara Zagora to see what else we could find. We went through lots of shaded and winding residential streets. Much like Turkey, there were little shops dotted along the houses that were stocked with odds and ends. It put a warm feeling in my stomach. We found an outdoor market where we bought a KILO of cherries for 1.5 lira. Doesn’t everything just taste so much better when it is cheap? We continued walking and exploring and eating cherries and perfecting our cherry pit spitting abilities. I am definitely the more talented one in this arena. We soon had tired ourselves out and decided to take a nap in the park. It was now 10:30 am. We didn’t know it yet, but we had already walked most of the town. In the next ten hours we would make about six more rounds of the town. I wonder what people thought as we passed their shops again and again and again… Luckily no one called the cops on us. As we stopped to rest in a different park later we saw the boy in the orange shirt again. This time he was sitting on a bench just watching us. We ignored him for the most part, not even fully realizing that we had seen him earlier. A few hours later we would see him in the same park again. This time he had a massive bottle of beer. Like 3 litres massive. This was a teenage boy who was pretty scrawny. It made the bottle look even bigger. We laughed a bit at this but a few minutes later we saw the boy take the bottle and hide it in the tree behind him. Then he got up and walked to a bench two feet away where he sat down, took off one shoe and just sat there with his back to us. Stuff like this happened all day. Particularly in the parks. This alone might be a reason to check out Stara Gazora. With such cheap clothes, the range of fashion or lack of fashion in Bulgaria is shocking. We walked into one “mall” and I literally stopped on my tracks. I have never, ever seen so much ugly in my life, not even at the state fairs in Michigan. I looked around to see if people were rolling over laughing but they all took this mall very seriously. Finally I figured out that there had been a competition to come up with the ugliest, tackiest, most ridiculous clothes you could think of and this building was merely a display for the winners. After I figured this out I was able to leave the mall in peace. Also, it cost .50 lira to pee there. No good. There also seems to be no settled on dress code for Bulgarian weddings. We witnessed two weddings in the park and the guest were wearing everything from cut off jeans, to Halloween costumes, to traditional dresses, to about 3 centimeters of clothing to disco wear. I have pictures to prove this. There were also lots and lots of old people. They all seem pretty healthy and like to play chess in the park. Well done Bulgarians. Bulgarians (or Bulgarian shop owners) have amazing taste in music. On multiple occasions I heard songs by Depeche Mode, Cher, and the Macerana, and Another Night, Another Dream. Feraz was not a happy camper because now I will not stop singing these songs. Since we began to think of things in terms of what songs we had heard playing there we remembered that at the very beginning we had seen the Depeche Mode restaurant and trekked back there. It was a glory land. They had sooo much stuff on their menu and the prices were too good to be true. I had half a roasted chicken with potatoes and garlic bread. 5 lira!! Up until we got our bill we didn’t believe the meal could be so cheap but there was no catch! On our way out of the restaurant, we saw the boy in the orange shirt again. By now I had figured out he was homeless. I wanted to hug him, talk to him, something. Instead I nodded my head at him like a tough guy which made him laugh. But being the tough guy he was he tried to look like he was not laughing. It was a good goodbye. Oh, Stara Gazora- we developed a major love-hate relationship with it and although we aren’t going to rush back to Bulgaria anytime soon, it was an adventure I am so happy we took. Going to Bulgaria for the weekend! See you all when I come back! The other day Feraz and I saw a baby owl right in the middle of Taksim! I really needed to share this with you all. Here are our most recent pictures. These are almost all taken by Fahad and I highly recommend viewing them in full screen. I used to be obsessed with celebrity gossip. It feels so strange to say that now. The idea of it seems so naturally repulsive that I can’t believe that I spent my years in law school basically addicted to it. Since I’ve left the US I’ve stopped checking celebrity gossip web sites, I don’t watch reality TV and until just now I didn’t even realize these changes had been happening. It is amazing the stuff that so quickly drops out of your life once you start living. What I have seen of the celebrity culture in Turkey is so different. Often times when we are having lunch at work or going for a little shopping after, one of my colleagues will note that someone walking by is a model, a pop star or an actress. Every now and then we see some of the footballers around. In the beginning I thought they were just pulling my leg. But then I began to realize they were serious. The amazing thing is, no one cares. No one stops to gape. People don’t pull out their camera phones and start snapping away and they most certainly don’t approach or bother these people who happen to entertain for a living. It is incredibly refreshing. And it is nothing like the US. What’s wrong with obsessions with celebrities? Everything. It reflects so many social ills and it stagnates progress in society. It affirms unrealistic expectations and creates superficial value systems. It promotes a culture of back-stabbing, gossiping and disloyalty. What’s wrong with reality tv? I used to watch shows like The Hills and I would almost always feel bad or disappointed with the type of people that live in the world. Most of the time, I would make fun of the people I had just watched. It may not seem socially significant, but each time that happens, it becomes easier for us to be mean in general, it makes us think that some people “deserve” to be made fun of, that they “deserve” to be ridiculed. And it is not long until this mentality seeps into our interactions with people we actually know. Many times we watch these shows and feel embarrassed for the people on the screen or think of them as pathetic. These shows often highlight the lives of rich, self-obsessed, catty girls. The men in these shows are often enablers and the girl’s conflicts almost always center on some male ‘loser.’ These shows highlight extravagant lifestyles or attempts to become rich, famous, or beautiful. And we forget in all this, that we are pathetic too. For helping to fuel this machine. For being a part of a cultural defect that is incredibly destructive to our society. For legitimizing it so much that it is now the mainstream. Even when I am reading the NY Times or the Washington Post I see what can only be classified as celebrity gossip in the news. Tweens like Miley Cyrus and the Jonas brothers are being invited to the White House. Pop culture is the language that we speak. Celebrity worship is our religion. I shouldn’t be so judgmental. I know I was wrapped up in this culture myself until quite recently. But living outside of it, I can see how destructive and barbaric it is. A lot of people might say that i should lighten up- it’s just for fun. But it’s more than that. There are an estimated 8 million anorexics in America. Every year, this disease claims more and more lives. Study after study has shown direct correlations between media images and the development of anorexia. When it is quickly becoming the culture that we breathe, how much worse will these numbers get for the next generation? Each year over 1.5 million women are physically assaulted by male partners. Every day 3 women die at the hands of their partner. Where do messages of inferiority and dependency come from? Each day, we are exposed to the degradation of women on celebrity websites and on these reality TV shows. And while we spend our time, energy and resources following the lives of celebrities, we are not bettering ourselves or our country. People in the U.S. know less about the world than almost any other country, which is humiliating considering our access to resources. The average person knows more about the latest celebrity than about their own president. Do you know that mainstream US magazines have different content than what the rest of the world see? What I am not saying here is that if you check People.com or watch a reality tv show that you are personally a degenerate. And I am not saying there is anything wrong with being interested in entertainment in its own sphere. But what I am saying is that the systematic infiltration of celebrity culture into mainstream society is destructive as a whole and is at the very best exasperating existing problems we have in our society and at worst creating a whole new slew of them. It takes up our time and energy and while we are wondering what catty exchange happened between two celebrities- we don’t know about basic domestic and international social problems. There is a price to pay for a voyeuristic and obsessive culture. There is a price to pay for filling our heads and our time with what can only be described as trash. I appreciate being away from America because in many ways it helps me value it more. It affirms how much I love it. But to truly love something, you must see it for what it is. You hope for something better for it, for the best for it. So, I look at my country with so much love and so much hope that it’s people will demand something better of it and of themselves.